Deck the halls with the festive home décor items in this box. The seasonal accents will look beautiful in your loved one’s home this winter and for years to come. 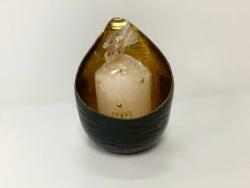 This elegant candle and holder can be used year-round. Uniquely shaped, the candlelight will look gorgeous reflected off the gold paint. No watering necessary for this beautiful wreath! 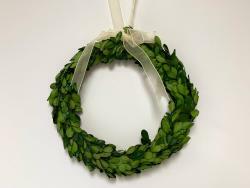 Made to last, this wreath can be used to accent doors, windows tables and more. 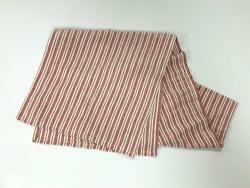 Use this veritable table runner to add a touch of color to your console table, coffee table or dining table. The farmhouse style red and white stripes can be used year-round, but look especially beautiful around the holidays. 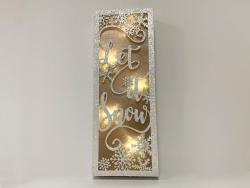 This sparkly, lit “Let it Snow” plaque will look great sitting on a table or hung all the wall all winter long. Light it up (batteries included!) for a soft evening glow. 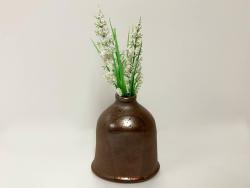 The unique shape and color of this handmade bud vase is a great conversation piece. With a touch of metallic paint, it is simple and beautiful.